As we know, the Infiniti models are sold under the Nissan brand in Japan. 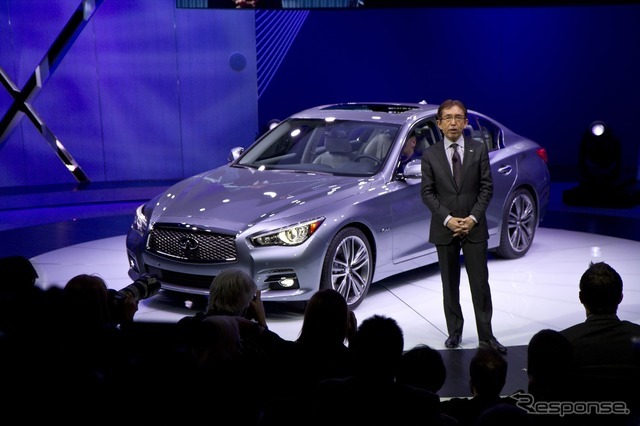 However, in consideration of a fact that the Japanese auto manufacturer plans to keep the status of the Infiniti brand as a luxury brand, the company has to extend Infiniti presence in the local market too. The first problem is to renamed sold cars such as the Nissan Skyline, which is known as Q50 abroad and the Nissan Fuga –known as the Q70. The carmaker plans to add the Infiniti badge to the current models Nissan Skyline and Fuga. The second task of a carmaker is to sell Infiniti cars at the Nissan showrooms because before Nissan models are sold there. The main reason of renaming is to increase the annual selling to 500,000 cars by 2017; it is impossible to do without adding new car markets. The new Nissan Skyline with the 350 GT hybrid trim is also known as the Q50 Hybrid trim in the United States will be sold with the price of about 45,300 dollars. Meanwhile, the previous Skyline or the Infiniti G37 will be in both markets under its original names. Infiniti EV delayed to add better technology.